“We have successfully adopted our third dog from The Heart of Rescue. What amazes me is that these dogs seem to know that they have been in a horrible place and are now joining a family that will cherish them. People need to understand there is a transition period. Our first dog would run every time we had something in our hand. She came to us with scars on her belly, but not on her heart. With a little time and proven TLC, she realized she was in a safe place. We had two babies after adopting her and she knew they were hers to protect. Everyone compliments her on her personality. Our second dog was abandoned because he is deaf. Such a ridiculous reason to discount a wonderful animal. He is now bonded with the family and the fact that he cannot hear only adds to his charm. He sleeps under the covers with us and we cannot imagine our life without him! My wife and I had to put down our beloved “Tank” in June of last year and it devastated us. 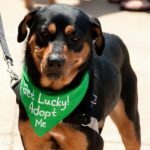 We didn’t know if we could ever go through that again, but after six months and realizing how much we were missing out on by not having a loving companion we started the search for another Rottweiler. We decided on adopting a rescue dog and contacted Sassa at THOR. She is the best. I can’t thank her enough for taking the time to talk with me about adoption, looking for the perfect fit for our home, and always replying quickly with an e-mail or phone call when a possible match for us became available. Although we eventually found “Tikka” through another referral , I can’t say enough good things about Sassa and THOR. 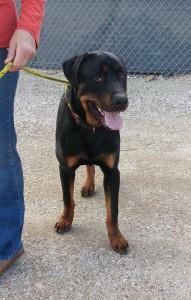 When I typed Sassa to tell her we had found our girl, she was so happy for us and another Rescued Rottie. It takes special people to do what the THOR volunteers do and their love for the cause and animals shows. Thank you from our hearts, Joe and Kristi E.
Love your service, and dogs. Thanks Gina, and Tracy for helping me out getting a dog. He is great and we have a lot of fun together. SHELBY, THE PUREST OF HEARTS. Me and my wife took on a little girl by the name of Shelby. We fostered her for five months down in Orange County. She came to work with us almost every day and found friends around the shop and with customers. Employees dogs made new great friends for her and closest of them all was Bandit, a two year old Lab and our boss’s dog. Fighting over toys, going for potty breaks together or visiting dog parks on our days off. Shelby would bark or whine in the store and Bandit would dart to her rescue or for back up. Just like two peas in a pod. She came with some medical issues that was a challenge but with this wonderful rescue behind us it turned into a very educational and loving five months. With Ursula, Gina, Andrea, Jessica, Dr. Audra and many others, they gave so much love, knowledge and emotional support that is was overwhelming. Shelby’s condition improved steadily and we smiled every minute of the day with her as she grew stronger and more confident. With fostering coming closer to an end we knew from day one that we would adopt this lovely creature. But every story does not have a happy ending. We found her snuffing food she used to love, restless nights both for her and us. Less activity, more napping and sleeping. Once again the rescue team jumped in with help, vet visits, phone calls, texts. Every hour of the day, morning , night they where there. Always positive, smiling, giving advise and endless love towards us and Shelby. She had cancer. Our heart dropped. I could see it in her eyes that she was tired. But never complained. Came to work, played as much as she could with Bandit. I think he knew in his heart about Shelby. We had hope, the rescue had hope. Can not tell you enough how the people at Thor rescue fought for her, Shelby, and with us. Endless texts, phone calls, appointments, new foods, nutrition to make her stronger. She left us on a Thursday, with me by her side, she was ready. Never easy to let go but you have to. This was for Shelby. Remember always do what is right for your pet, don’t be selfish. These five months where unbelievable. Every minute with Shelby stays in my heart and thoughts. In closing always look to foster or adopt, or both. The Heart of Rescue is an organisation that has heart and mind in the right place. Every body involved with Shelby are angels in my mind. Shelby is smiling down on us. Thank you for the wonderful experience provided. I had benefitted immensely, thanks to all the caring and dedicated staff. It was a memorable time that I will cherish for the rest of my life. Thanks for doing a great job of taking care of the pets! As a vegan and animal lover we absolutely adore what you guys are doing! Appreciate it a lot and we look forward the next visit!